...to get your party frocks out! Christmas work do's and festive family parties are all starting to happen...umm...now! I'm never prepared for the holiday season, I've only bought one present and refuse to put the decorations up until mid-December! I work all day 5 days a week now too so it's hard to even get a look in the shops! I love this, it's sparkly and I can imagine would totally flatter your figure! Huge price tag but I love the shape! The teal colour is gorgeous and the little bow adds cute detail. Love me a bodycon and love how this looks like a skirt/top combo. If only I was rich! What dresses do you have your eye on? Are you doing anything fun over the next 4 weeks? I have a Christmas Ball coming up next weekend so really need to chose something to wear! I absolutely love the leopard print one, but definitely too pricey for me! i like the 2nd and last one the best! the others don't do it for me. i bought mine last weekend, so excited to wear it! Lovely dresses, i like the Zara and the Topshop the most i think. I've still not decided on a dress and our do is in a couple of weeks, need to go shopping! Oooh, I'm a sucker for leopard print! I've got my eye on a couple dresses but like you I don't have the time to go looking for them. I've got a work do coming up but that's about it. Hope you start to feel the festive joy soon haha. Have a lovely week. I love the river island one. I've not even contemplated a Christmas dress yet, how bad am I?! Its my 21st at the start of January and Im desperatly searching for dresses, and having such a bother, nothing is "right" I dont want to wear tights so it needs to be about knee length and everything is shorty short at the mo! That Zara one is gorgeous though! that leopard print dress is adorable! 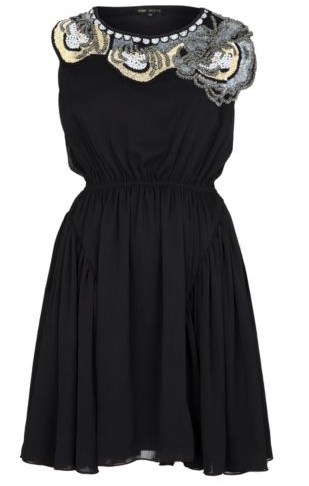 I absolutely fell in love with the Zara dress when I saw it, but hate the price tag! My university is holding a Christmas Ball this weekend so i'm on the lookout for some party clothes, but there's sweet nothing in Falmouth. Can't believe that Christmas is so near!! I love the river island one! I really need to sort a dress out, just incase of any parties! Finding the perfect party dress is always such hassle, esp as I normal try to find one that I can easily style differently and wear to numerous parties this season. Love the bottom topshop one. Nice blog! I'm now following you!! that Zara dress looks gorgeous! It's so hard to find a proper dress for me, they are always too long. I've been lusting after that zara leopard one for a while! It's gorgeous! The first one is beautiful - can't beat a bit of sparkle at Christmas! I'm going for a 60's vibe for the work Christmas do this year - picked up a pretty teal dress dead cheap in Primark and now I just need to learn how to beehive my hair and put eyeliner on properly!